Can you identify the man in the photograph? Do you think he is wearing some sort of a uniform? 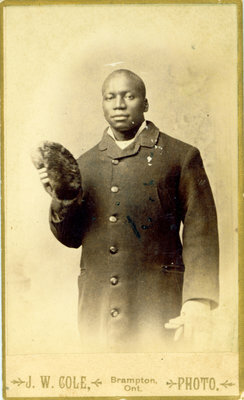 This is a small cabinet card of an unidentified man, photographed by J. W. Cole, of Brampton, Ont. He is possibly a relative of the Bell - Sloman family, whose descendants include former Black slaves who settled in Canada. While this photograph is undated, it is believed to be taken between 1865 and 1884. The photographer's stamp is printed in gold lettering along the bottom of the card. This photograph was in the possession of Iris Sloman Bell, of St. Catharines. Two photographers by the name of Cole are known to have worked in Brampton, Ontario in the latter half of the 19th century. J.F. (John W.?) is listed as a photographer in 1882, while John W. Cole operated from 1865-1884. He also dabbled in commerce, selling fancy goods. Phillips, Glen C. The Ontario photographers list (1851-1900). Sarnia: Iron Gate Publishing Co., 1990.